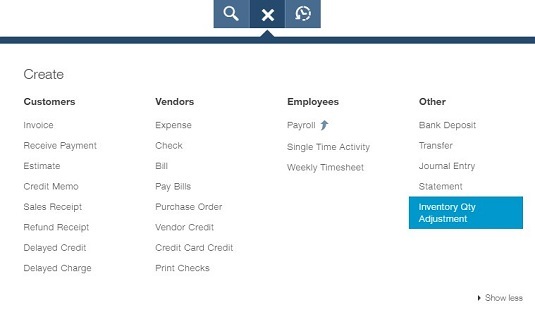 On occasion, you might need to make adjustments to inventory item information in QuickBooks Online. Specifically, you might need to adjust inventory item quantities on hand or starting values. You can edit any item to change descriptive information, such as its name or description; just click the Edit link in the Action column beside its name on the Products and Services page to view the item’s information. You might discover, particularly after physically counting inventory, that you have a different number of an inventory item than reported in QBO. In this case, you need to adjust the quantity in QBO to match what you actually have in stock. Remember to use the Physical Inventory Worksheet report in QBO to record item quantities on hand as you count inventory. The report information can help you determine the adjustments you need to make. Click the Create menu (+ at the top of the QBO window) and choose Inventory Qty Adjustment.QBO displays the Inventory Quantity Adjustment window. If necessary, change the adjustment date and the Inventory Adjustment Account. In the table, click the Product field, click the drop-down arrow that appears, and select an inventory item. Starting an inventory item adjustment for a single inventory item. Don’t forget that the Create menu plus sign changes to an X when the menu is open. You can use this window when you have just a few adjustments to make. 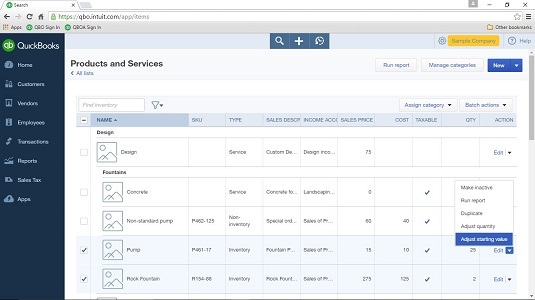 QBO fills the inventory item’s SKU, description, and quantity on hand. QBO also suggests the Qty On Hand value for the New Qty value. If you’ve enabled class and location tracking, you can supply information for those fields as you complete the Inventory Quantity Adjustment window. Enter either a new quantity or a change in quantity. Enter -5 in the Change in Qty field. Repeat Steps 3 and 4 for each inventory item you need to adjust. In the Memo field, enter a description that explains why you made this adjustment. If you have a lot of inventory items to adjust, you can save some time by preselecting them and adjusting them as a batch. Choose Gear→Products and Services to display the Products and Services page. Selecting multiple inventory items to adjust. Then, select the inventory items you want to adjust by placing a check in the column to the left of the item name. Click the Batch Actions button and choose Adjust Quantity. QBO displays the Inventory Quantity Adjustment window shown previously,but prefills the window with the information about the inventory items you selected. Complete Steps 4, 6, and 7 above for each item in the window. Click the Create menu plus sign (+)→Inventory Qty Adjustment to display the Inventory Quantity Adjustment window. In the upper left corner of the window, click the Recent Transactions button. QBO displays recent inventory adjustment transactions. If the adjustment appears in the list, click it. If the adjustment doesn’t appear, click More to display the Search page, where you can expand your search for the transaction. In most cases, changing the date range will do the trick. You can remove a line from an adjustment by clicking its Delete button at the right edge of the row. Suppose that you made a mistake when you set up the starting value for an inventory item; you can edit the item’s starting value as long as you created the inventory item after the November 2015 QBO release. Changing an item’s starting value can have wide-ranging effects, and QBO will display a warning to this effect when you start your inventory item starting value adjustment. If you’re not sure about what you’re doing, ask your accountant. Please. Choose the Gear→Products and Services. In the Action column beside the inventory item you want to adjust, click the drop-down arrow and select Adjust Starting Value. Getting ready to adjust the starting value of an inventory item. QBO displays a warning explaining that changing an inventory item’s starting value may affect the initial value of your inventory. Assuming you’ve heeded the warning above and know what you’re doing, click Got it! 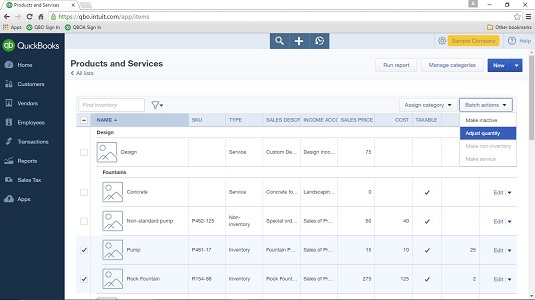 QBO displays the Inventory Starting Value window. Use this window to adjust an inventory item’s starting values. If you’ve enabled class and location tracking, note that you can supply information for those fields along with other fields that affect the inventory item’s starting value. You can’t change an item’s inventory asset account from the Inventory Starting Value window. 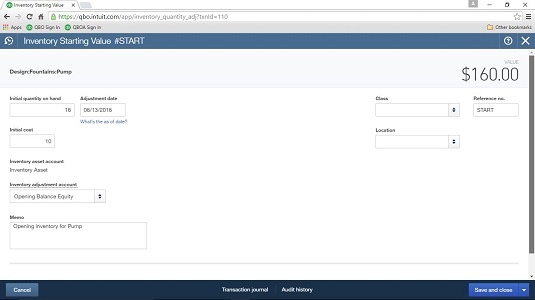 To change the item’s inventory asset account, display the Products and Services page and click the Edit link for the item to display the item’s information in the Inventory Item Product/Services Information panel.